Pak Suzuki Company, the Pioneer Automotive Company of Pakistan recently launched brand new model range Suzuki Swift, Swift 1.3L on 7th January 2010 nationwide. It’s the second time in this decade Pak Suzuki managed to introduce 1300cc category vehicle replacing Suzuki Liana, which haven’t captured Pakistani Auto Market. The All New Suzuki Swift 1.3L that won almost 250 international awards in 98 countries, which is launched in 2010 Pakistan to achieve similar kind of response from Pakistani Auto Lovers. 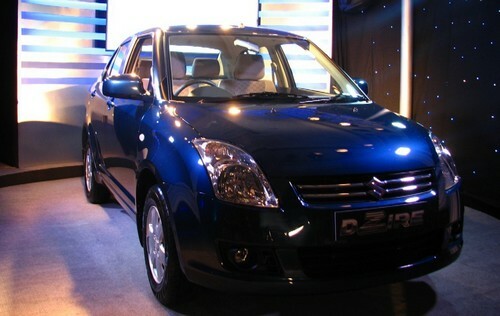 The recently launched Suzuki Swift 1.3L belongs to the model range of Fifth Generation. Replacing Kei and Cultus from Fourth and Third Generation respectively, in Fifth Generation Suzuki Motor Company expanded sporty touch along with dynamic hatchback style. Suzuki Swift Fifth Generation onwards from 2004 just launched in Pakistan this year. Suzuki Swift features 1.3 liters (1300cc) powerful engine comprising Multi Port Fuel Injection that allows ideal fuel consumption for South Asian People. The Suzuki Swift features a unique and highly unconventional design despite of having engine capacity of 1300cc its exterior body shape relates to conventional 1000cc hatchback. It clearly dodges one who didn’t know about technically because mostly 1300cc vehicle looks like sedan and saloon type. Suzuki has innovated taste of 1.3litres in an extravagant fashion. The New 91bhp 1.3 Liters Engine provides great performance for almost everyone The Swift engine features DOHC having engine type of M13A with 4 Cylinders and 16 Valves Operations along latest fuel delivery system “Multi Point Fuel Injection”. The latest arrival is only available in 5 Speed Manual Transmission. Featuring Electronic Brake Force Distribution Technology, Swift chassis enabled with Antilock Brake System, which allows vehicles to drive on slippery conditions without any resistance possessed by conditions. It also controls directional movement by wheel lockup during brake application. Steering System is composed with Rack & Pinion Type, Front Brake enclosed with Ventilated Discs and Rear Brakes with Drum Lining & Trail Type. The new Suzuki Swift is equipped with the latest Electronic Power Steering System. The EPS technology enhances driving control also improves steering ability for driver. It puts a lesser amount of load on engine with maintaining excellent fuel economy. The fifth generation belongs to physical outlook of whole model. Japanese engineers implemented superb design to hatchback model. Its cabin is classy and enough powerful right through. Swift is composed with high and low beam Halogen projection lamps, fog lamps on front, matching colored bumpers on both sides, electrically controlled door mirrors & windows. High class of Vibrant colors available which includes Pearl Red, Graphite Grey, Solid White, Indica, Aqua Blue, and Silky Silver & Eminent Blue. Pak Suzuki set the introductory price of the all new Swift from Rs.999, 000/- with the least version. In the definitive budget of 1 million you can easily get 1.3litres classy swift car which have enough built-in features along with great resale value too. 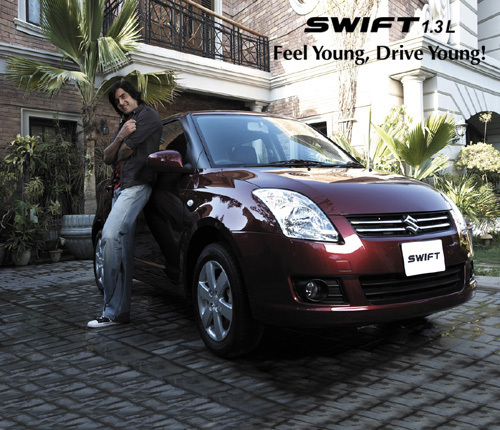 The Suzuki Swift1.3L also much attracted to young teenagers due to flashy and sporty design. As the promotion of New Suzuki Swift relates, “Feel Young Drive Young” it clearly suggests that latest arrival have much stuff for youngsters. This Suzuki latest arrival has much positive things to deal with including attractive design, powerful engine, smooth drive and more importantly price factor according to South Asian Market. The only thing which is biggest drawback is lack of boot space comparatively to other 1.3’s traditional design. 5 Responses to "Suzuki Swift 1.3L Review – Priced at PKR 999,000/-"
quite intresting info good job !